The tubes come with silver nickel plated plain mounts, which are resistant to corrosion and add a nice touch to the overall design. The assembly is somewhat complicated. A traditional bagpipe model for professionals from Tartan City which can deliver truly magical sounds when used in the right hands. This model is made of premium-quality materials and comes with a hard carry case, which simplifies the process of transportation. The tutor book that comes with the model will help you to learn the instrument in a shorter period of time even if you haven't played any woodwind instruments before. The full package is rather bulky. 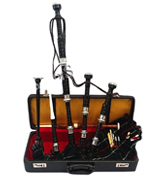 The Great Highland Bagpipe that comes with a full set of accessories, an elegant carry case, and assembly book will be a great gift for an aspiring musician. The synthetic bag is covered with a traditional Scottish tartan cover, which in combination with the black cane and tubes create a unique design. 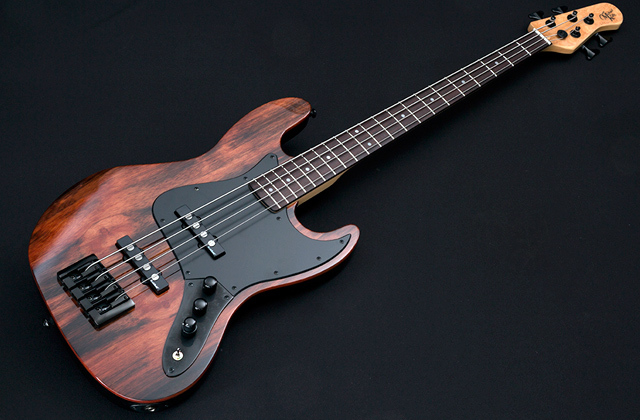 On top of that, this model produces a stunning and powerful sound. 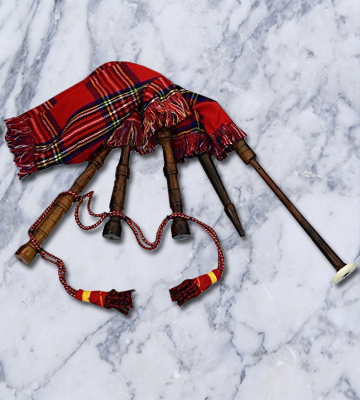 Practice chanter with 2 practice reeds will help you in terms of learning how to blow into the tube so you could truly enjoy the melodic sound this bagpipe can create. The initial tuning can be rather difficult. 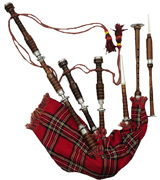 This Tartan City bagpipe has a distinct and sonant sound and a traditional Scottish design. 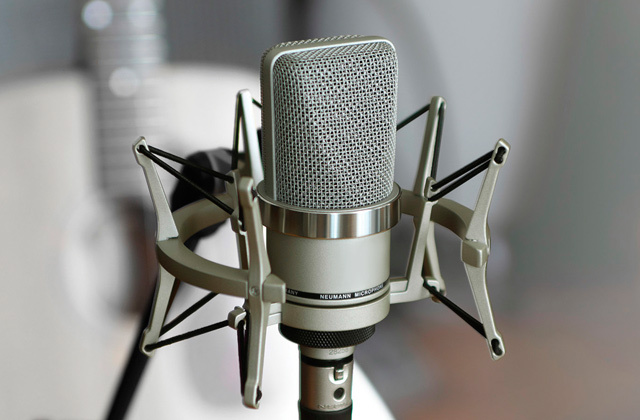 The joint elements of the tubes are a bit longer than standard models, making the sound more high-pitched. On top of that, the kit features everything needed for maintaining and storing the instrument. 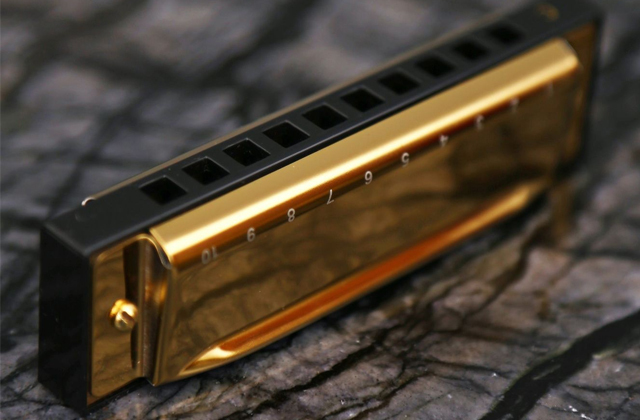 This particular instrument is a true work of art that has been completely handmade. Every single cut on the wooden tubes was made with a maximum attention to details, while the bag is stitched with straight double stitches. The fringe gets easily stained. 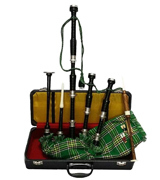 The bagpipe from Shyne Kilts will be a perfect gift for a kid since it is a short-scaled model. Despite that, the bagpipe is an exact copy of a professional instrument, which will help in developing proper breathing skills and lung capacity even for the most difficult bagpipe pieces. 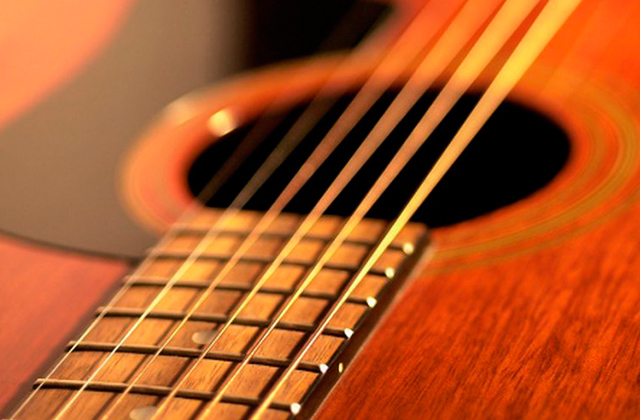 The musical instrument is compact and doesn't have any metal parts, which makes it extremely lightweight. Thus, the bagpipe can be transported in a regular bag. 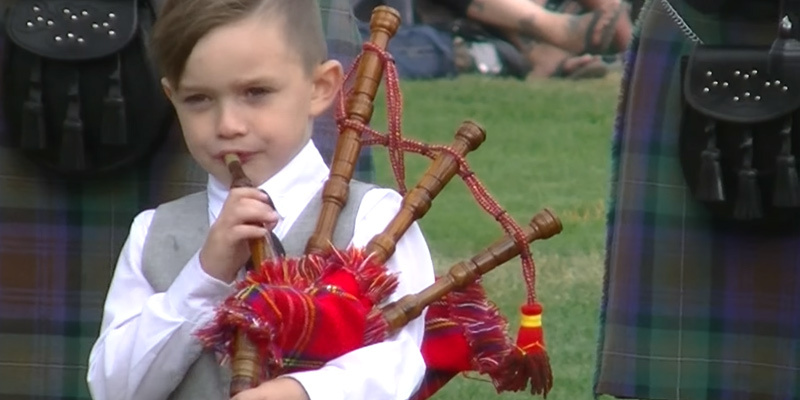 The manufacturers did a sloppy job connecting the drone reeds to the bagpipe. Tartan Tweeds bagpipe is a great choice for kids and entry-level musicians at a very reasonable price. The traditional design features tubes and drones made of natural wood that is varnished and polished, as well as a synthetic bag with a tartan cover. 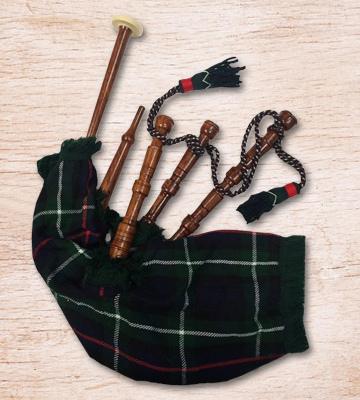 This Highland from Tartan City is a model that was designed specifically for professional bagpipe players. The bag is made of a synthetic airtight material which reduces the weight of the instrument. The tube, drones, and the blowstick are made of rosewood covered with a black, glossy paint that gives the instrument an aesthetic look. As for the chanter, it is also made of rosewood but is not covered in dark paint and thus, even an amateur piper can clearly see the scales. On top of that, the tubes feature silver plain mounts that are covered with nickel, which also contributes to the longer service life of the instrument. The overall look of the instrument is quite neat thanks to a traditional Irish tartan cover on the back. 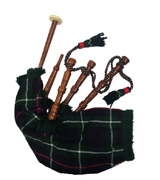 The synthetic bag is made of high-quality rexine, which makes the bagpipe completely airtight. In addition, the reeds of the drones are also synthetic and durable enough to last for a long time before you will need to change them. Since most of the parts are made of artificial materials, this Irish bagpipe is relatively lightweight compared to other similar models. 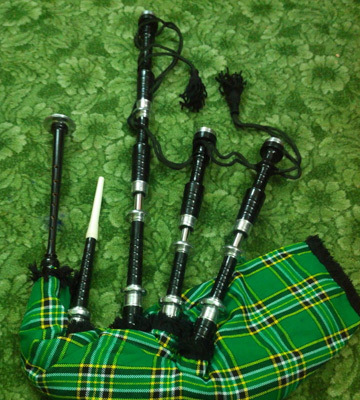 In conclusion, despite its modest price, this highland bagpipe can deliver a truly stunning sound that is both warm and loud when it is played by strong arms and lungs of a professional piper. The Scottish bagpipe from AJW comes in a rather bulky package of everything you will need in order to learn how to play this musical instrument. The bagpipe kit includes an assembly book that will help you put the instrument together and complete the initial tuning. What is more, the package includes a full set of accessories, such as a set of drones, cane, and reeds. Since this model is a budget version of a professional musical instrument, most of the parts, as well as the bag itself, are made of synthetic materials. On top of that, the instrument comes with a hard case that perfectly fits the bag and the tubes. 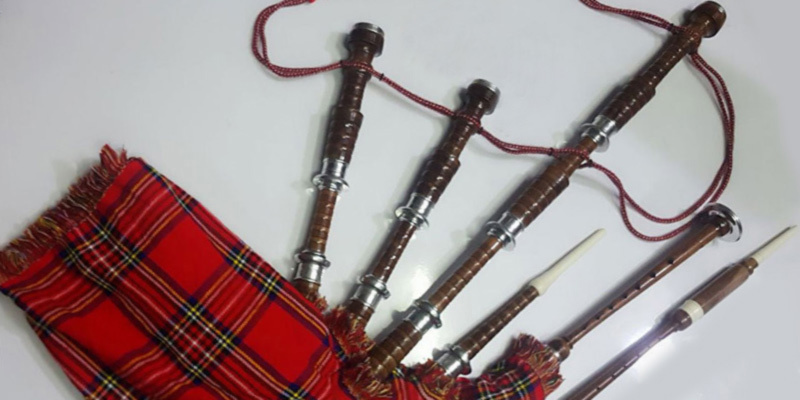 Unlike many other Scottish bagpipes, this particular model comes together with a tutor book which will come in handy for inexperienced musicians that have just started to learn how to play the first tunes on the pipes. The overall design isn’t just for the show and features a tartan cover of Scottish clan Mackenzie. As for the blowstick and drones, they are made of rosewood and painted with a jet black paint which in combination with a pattern on the bag itself creates a nice composition that is both melodious and stylish. 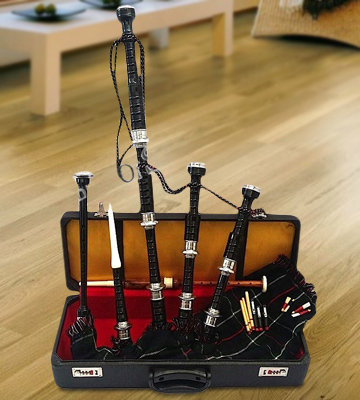 Finally, this bagpipe kit from AJW will be a perfect choice for a beginner piper since it has just about everything required to start practising. 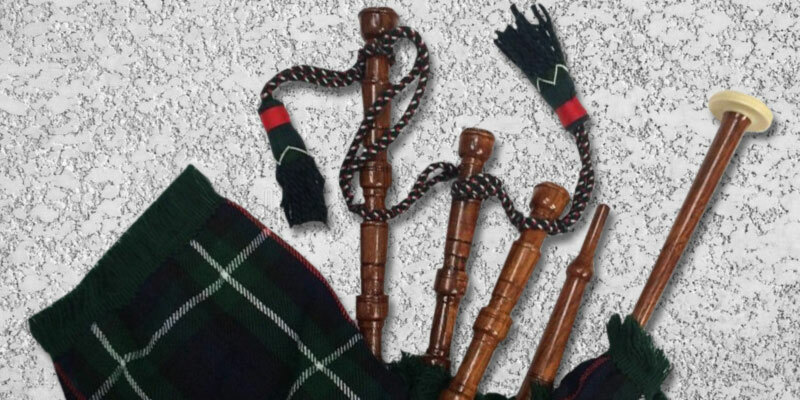 Although the Great Highland bagpipe is a model that is designed for professionals, it is also suitable for beginner pipers who are familiar with the instrument but haven’t had a chance to put enough hours of practice. The instrument itself comes together with a full set of reeds. To be more specific, the package features a set of regular drones and a set of synthetic drone reeds that are a pretty good budget solution for the part that tends to wear out the most. As for the pipes and chanters, they are made of rosewood, a kind of timber that is traditionally used in this type of bagpipes. Plus, both pipes and chanters are smooth and neatly polished. More importantly, the kit includes a set of 2 practice chanters that will prove to be real time savers for the beginner bagpipe players. 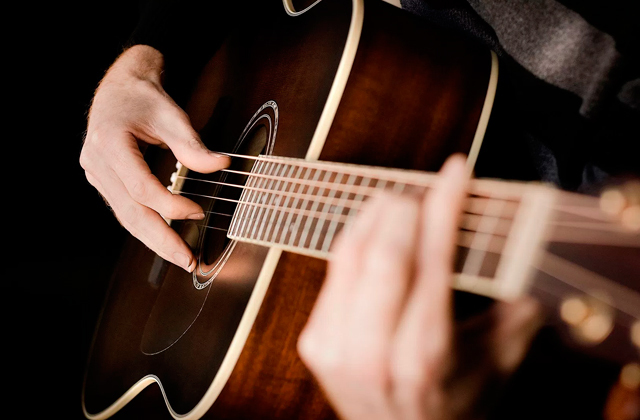 Entry-level musicians will be able to learn the scale of the chanter in the comfort of their home without disturbing their neighbours or family members, meaning they will also have more time on their hands to practice. 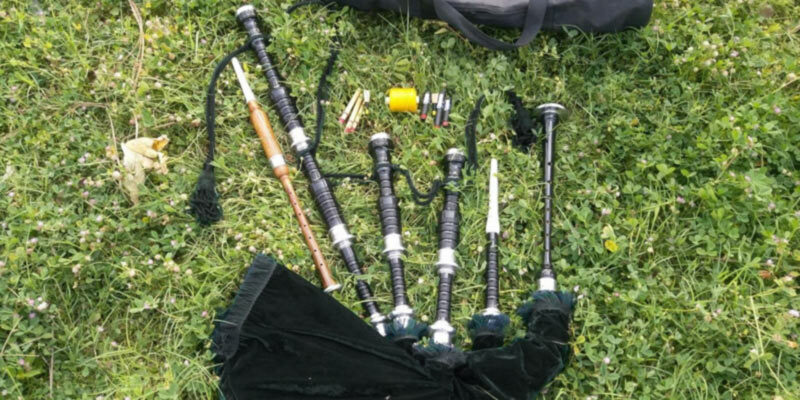 The initial tuning of the instrument may be somewhat complex for beginners, so we highly recommend inviting a professional piper or tutor from your area to do that for you. Otherwise, the sound coming out of the pipes will be a little bit high-pitched. 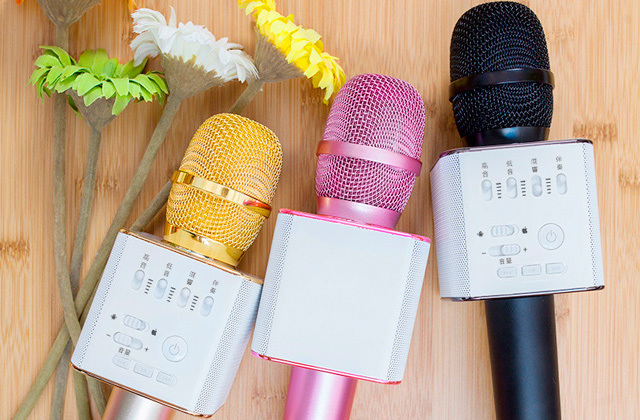 All in all, despite some minor flaws, this is a budget-friendly instrument that can be used both professionally and as a model for beginners. The junior bagpipe from HOH is, as you would imagine, a junior model that is scaled down in size. It will be an ideal gift for children that want to start playing this unusual pipe instrument. 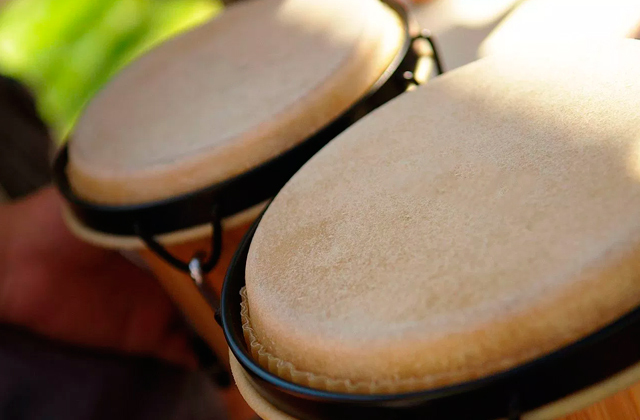 Although it is not a professional musical instrument and more of a smaller version of a bagpipe, it does sound quite similar to a pro-level instrument. Of course, it doesn't sound identical but you'd have to be a really experienced piper to notice the difference. 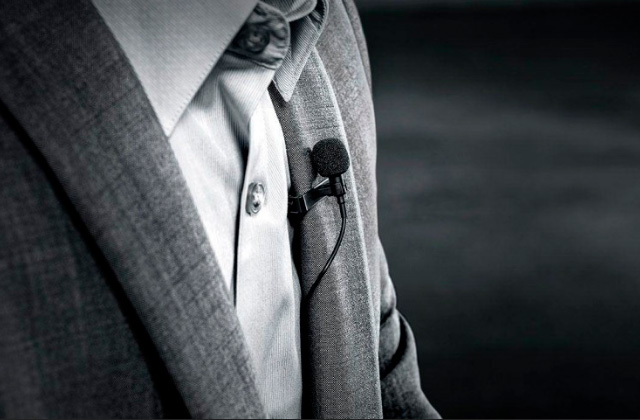 The instrument itself is almost completely handcrafted and the fine craftsmanship can be seen all over the canes and drones. As for the wooden parts, all of them along with a blowstick are made of coconut tinder that gives this bagpipe a distinct sound that differs from the regular pipes made of rosewood. The bag of the instrument is made of synthetic materials as well as the frets in the drones. As for the design, it features perhaps one of the most famous patterns in the world - a Royal Stewart tartan. This particular kind of tartan just screams Highland heritage, which is probably one of the reasons why it is the Queen’s favourite tartan. 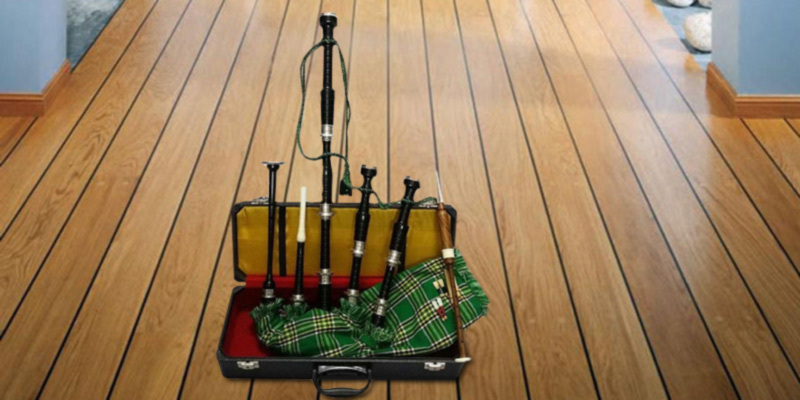 Overall, the HOH junior bagpipe will be a great instrument for children and teen musicians who would like to familiarise themselves with this kind of pipe instrument. Despite the fact that bagpipe is a musical instrument that has only 9 notes, many regular people, as well as experienced musicians, know that the bagpipe is perhaps one of the most difficult instruments to both play and master. In order to become a professional piper, you will need lungs of iron and a lot of patience. 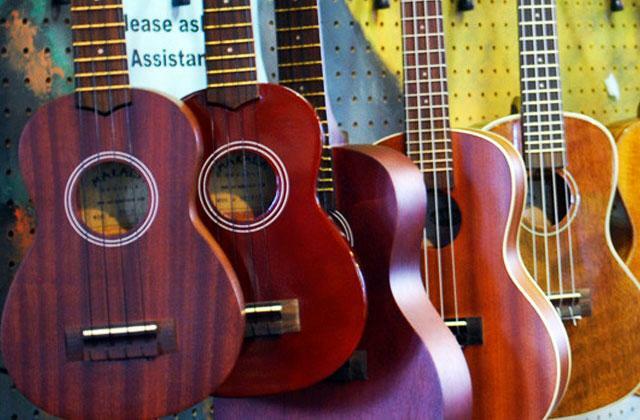 To be able to play professionally, most people start learning the instrument from childhood. However, the regular-sized models may be somewhat bulky and heavy for a child, which is why the junior bagpipes are so popular. Fortunately, the Tarran Tweeds is one of them. 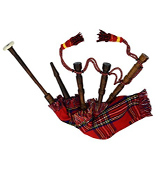 Since this model is a short-scaled and lightweight version of a real bagpipe, dissimilar to many other toy bagpipes, it is a perfect model for children or teens that want to learn how to play this iconic musical instrument. The overall appearance of this bagpipe is quite elegant, thanks to the varnished wooden drones and the tubes that have been rigorously polished. Moreover, with the Mackenzie Clan tartan cover, the bag looks as Scottish as it gets. As for the bag itself, the high-quality artificial material keeps the air inside and slowly blows it out through the drones when you push it with your hands. 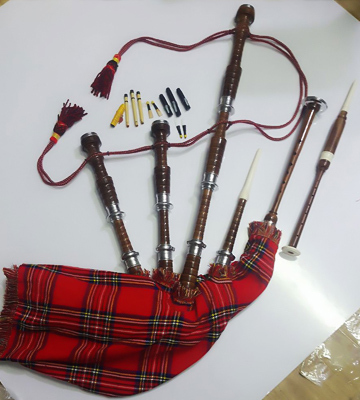 Since it is not a professional nor a full-scale bagpipe, we would only recommend this model to beginners who are just starting to learn the ropes of how to be a highland piper. Thomas Beecham once famously said that a true gentleman is the sort of person who can play the bagpipes, but doesn't do that. Well, Mr. Beecham, we beg to differ. Sure, the sound the musical instrument in question produces isn't quite as sophisticated as the sound that certain other instruments make. But even among such a specific category as woodwind instruments, bagpipe is by far the most complicated instrument and the kind of tune it can deliver is incomparable to any other instrument. 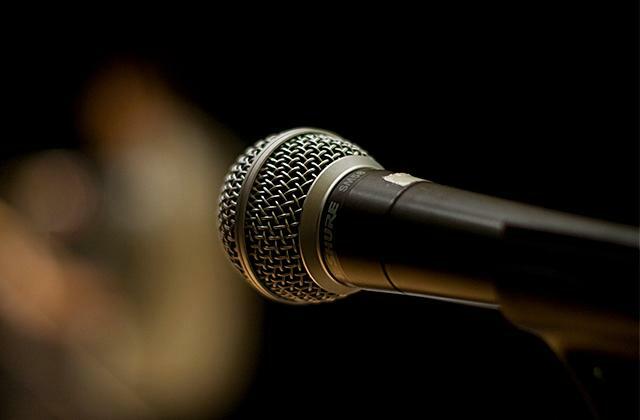 Of course, truth be told, it is also one of the most difficult instruments to learn, but you can't put a price on having such a unique skill at your disposal. As this is a complex instrument, there are a lot of parts to it, but the most important and fundamental ones are a blowstick, a number of drone reeds, a chanter, a chanter reed, and, of course, a bag. Despite the popular opinion, the sound actually comes from squeezing the bag and not from blowing the blowstick, though it is all of the latter that define the way this musical instrument sounds. 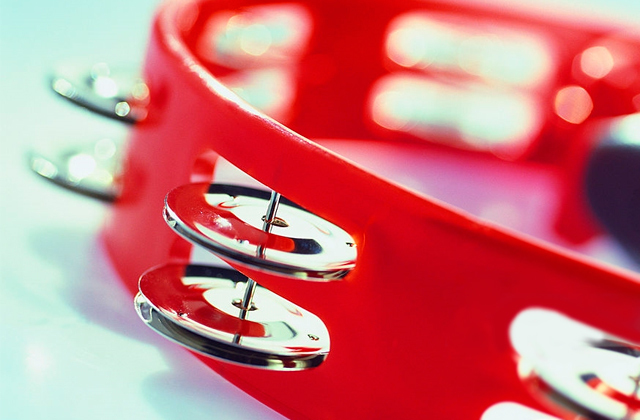 Having said that, if you do not care for such a difficult musical instrument, you could always get yourself a tambourine or a harmonica instead. 1. 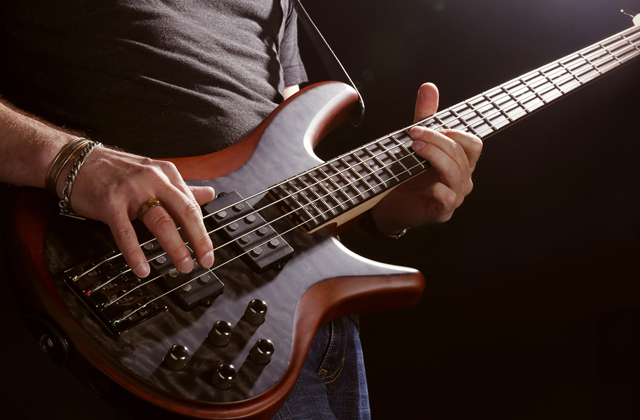 Hardest Instruments to Play, The Top Tens. 2. Bagpipe Parts, U.S. Coast Guard Pipe Band. 3. How Do You Play the Bagpipes? Wonderopolis. 4. Ben Johnson The Piob Mhor, or the Great Highland Bagpipes, Historic UK.